Antidepressants have been associated with weight gain since they were first used about 50 years ago. Tricyclic antidepressants (TCA) relieved depression but left patients considerably heavier as a consequence of treatment. One in particular, amitryptyline, was associated with uncontrollable sugar cravings. When Selective Serotonin Re-uptake Blockers (SSRIs) were introduced as the new generation of antidepressants, it was hoped that weight gain would not be a problem. Unfortunately this expectation has not been realized. Clinician were optimistic about Prozac, the first of the SSRIs, as patients lost weight during the early months of treatment. Prozac was viewed not only as an effective mood regulator but a potential weight-loss drug as well. It was tested in a national study and although weight loss did occur early in the study, weight gain followed. By the end of the study, patients on the drug weighed the same as they had before starting the program. The potential to cause weight gain is not limited to Prozac; at this point there is no effective antidepressant that does not have the potential to cause weight gain. Moreover, drugs used to treat bipolar disorder and schizophrenia may leave the patient with l00 or more unwanted pounds. There is still no explanation of how the drugs interfere with appetite and weight regulation. Some animal studies focusing on drugs like Zyprexa that cause substantial weight gain suggest that the drug interferes with other brain chemicals such as histamine or a sub-group of serotonin-containing cells, thereby promoting hunger. But so far no one understands how drugs like Zoloft, Paxil, Lexapro or Prozac are able to limit or prevent control over food intake. Several years ago, I was asked to set up and run a weight management center at McLean Hospital, a psychiatric facility associated with Harvard Medical School. Our clients were drawn from the surrounding communities but what many had in common was weight gain during treatment with psychotropic drugs; some took two or three medications. What was striking about their problem is that almost all had been thin before starting on their medications. Before getting sick, these men and women never had emotional issues with food. They ate healthily, had never been on diet, and tended to enjoy exercise. All were startled by the change in their eating habits and, of course, in their bodies. Weight gain ranged between 15 and 40 pounds for those on antidepressants and between 75 and 125 pounds for those on mood stabilizers and atypical antipsychotic drugs. What they all had in common was the inability to turn off their urge to eat, regardless of how much food they were consuming. Since then, as now, no one really knew how to deal with this type of weight gain we decided to try an approach that had worked with typical obese clients. We knew from our research and previous clinical experience that increasing serotonin synthesis increased satiety. The SSRIs that theoretically should have activated this serotoninergic function was doing just the opposite, i.e. causing the patients to feel a chronic need to eat. All carbohydrates with the exception of fructose (fruit sugar) will lead to an increase in serotonin synthesis if the carbohydrate is consumed without protein. The process involves the uptake into the brain of the amino acid tryptophan, the precursor to serotonin. Insulin release after carbohydrate digestion removes from the circulation other amino acids that compete with tryptophan for brain uptake. Tryptophan enters the brain easily and is quickly converted into serotonin. Protein consumption, even if eaten along with carbohydrates, floods the circulation with these competitor amino acids and tryptophan, the scarcest amino acid in protein, does not get into the brain. Thus the diet we developed to increase serotonin synthesis consisted of scheduled consumption of easily digested carbohydrates during the day and in the evening. Clients were given a carbohydrate-containing beverage previously developed at an MIT research study to drink late in the morning, late in the afternoon and if needed about two hours before bedtime. The drink contained a mixture of fast and slowly digesting carbohydrates and no fat or protein. Clients were also given a list of carbohydrate snack foods that could substitute for the drink. In addition we gave the clients a nutrient-rich, reduced calorie food plan to follow. They were also encouraged to resume the exercise some of them had abandoned after gaining weight. The satiating effects of the increased serotonin synthesis were felt within an hour or so of consuming the carbohydrate drink. Our clients told us that the nagging need to eat went away. They had no trouble following the reduced-calorie food plan because they were not hungry. And they lost weight, despite continuing on the medications that had caused their weight gain. 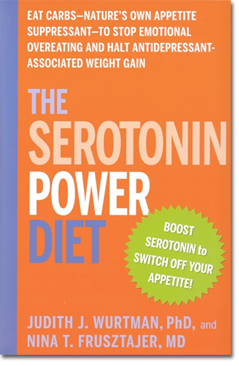 This approach to reversing antidepressant weight gain, now detailed in The Serotonin Power Diet, is simple and effective. For maximum efficacy, it should be put in place at the start of treatment so that weight gain can be prevented. However, because consuming carbohydrates is such an integral part of the plan, those whose medications have caused them to develop obesity-associated diabetes cannot use it without supervision by a dietician. One interesting benefit of this approach to weight loss is that many of our clients reported simply feeling better. They told us they felt calmer, less anxious, slept better and were more relaxed. The opposite was also reported by some of our clients who had been told to avoid eating carbohydrates by their physicians in order to lose weight. Many reported a worsening of their mood and one told us that she contemplated suicide after being taken off carbohydrates. It is hoped that soon there will be a new class of drugs to regulate mood disorders without causing the distress of weight gain. But in the meanwhile, the best solution to this weight gain is to take advantage of serotonin’s ability to turn off the appetite by simply eating therapeutic amounts of carbohydrates.